Looking for stylish yet comfortable clothes? You must check out clothing by Agnes & Dora. 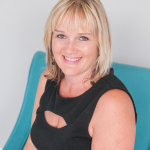 Lauren Maxwell is an Independent Rep for the company, and has sent me many beautiful pieces of clothing I want to show you and tell you all about. It has been said that “confidence is the best outfit”. What we wear is a reflection of our personal beliefs and we wear it like a coat of arms. Throughout history, a coat of arms have been worn by a tribe or group of people to intentionally deliver a message. It was worn as a symbol of their identity. Wearing a coat of arms makes a declaration about who we are and what we show the world. We must claim our power and have a conviction of our worth and value within ourselves. Not only are we enough, we are also beautiful, confident, strong, kind, intelligent and more. The world reflects our beliefs back to us according to our own personal coat of arms. My intention in building Agnes & Dora has been to encourage others to create a better life for themselves. I want to change the way the world sees us by changing the way we see ourselves. Our Agnes and Dora coat of arms is defined by our mission statement, guiding principles, and vision statement. Agnes & Dora offers Leggings for women and children, Skirts, Tops, Beautiful Dresses and also Layer pieces at affordable prices. Below are the items I was able to review. This top retails for $30 and is very comfy and stretchy. 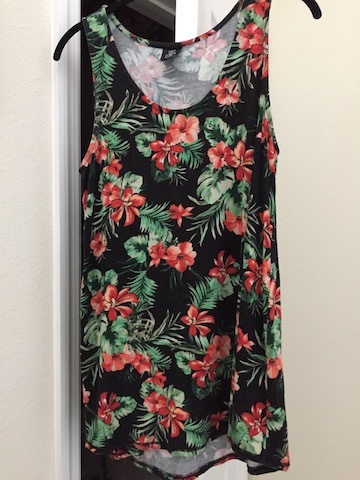 It is recommended to size down in this top. It is available in sizes XS-L and comes in a variety of solids and prints. 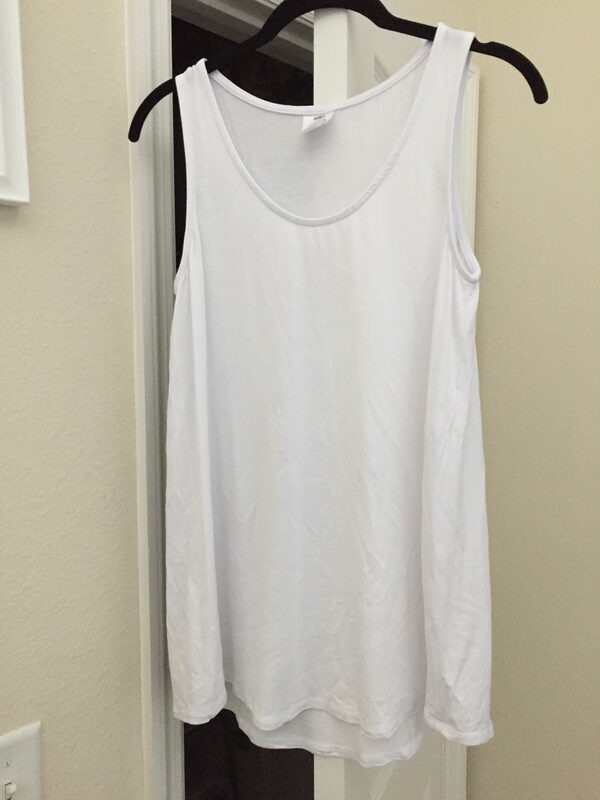 This is the perfect Tank for warm weather and to layer. It is very comfy and washes very well. It is available in sizes XS-XXXL and comes in a variety of solids and prints. 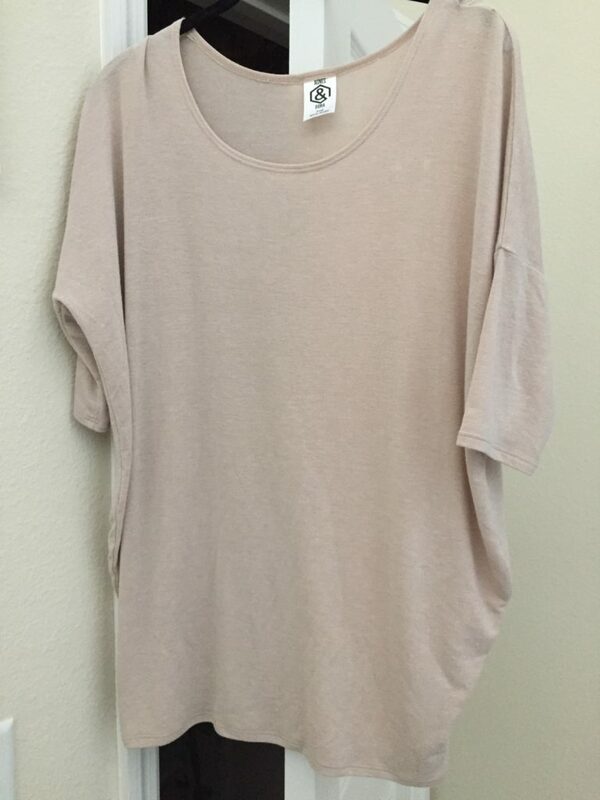 This top retails for $28. This dress is stunning! This is the perfect little dress to wear to work, holiday parties, a night out…pretty much anything goes with this dress. So stylish and comfy, and comes in different solids and prints. 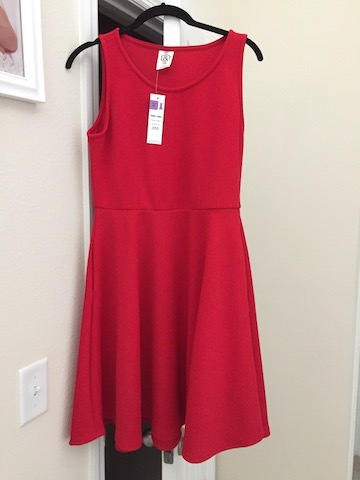 This dress retails for $58. Washing instructions are on each tag, all are machine washable with hang to dry. If you are interested in Agnes & Dora clothing, please contact Lauren Maxwell to see what she has in her current inventory to purchase! Links are below! Lauren will be giving 1 pair of Leggings to a lucky reader! Please join her Facebook group and comment here with your Facebook name so you can be entered! Giveaway ends on 11/30. U.S. residents only. *I received the mentioned clothing in exchange for my honest opinion. Do you know a little girl or teenager that is a huge fan of The Nightmare Before Christmas? If so, I have found the perfect holiday gifts! 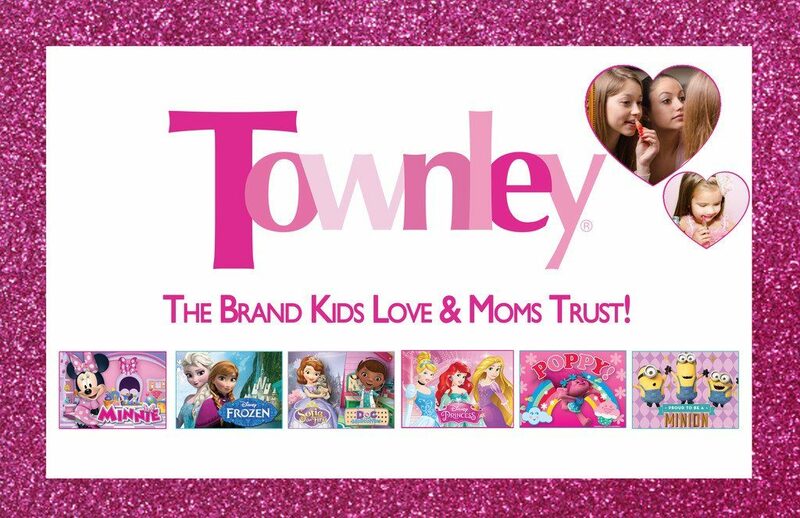 Check out these awesome lip gloss sets from Townley Girl! 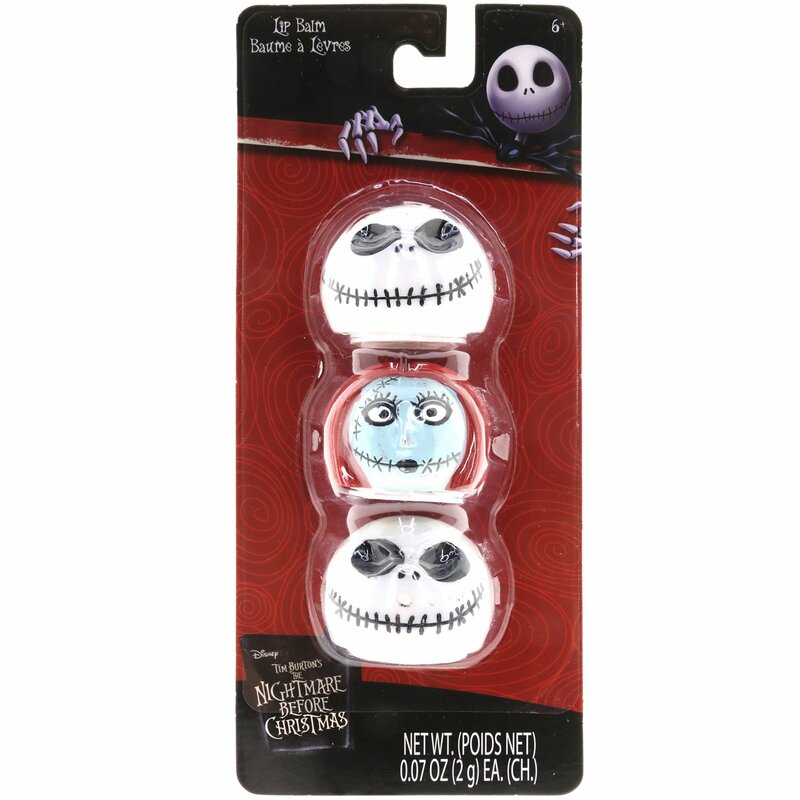 Our Nightmare Before Christmas gifts for girls is colorful, cool, and just a little creepy. Take a trip to Halloween Town with the trendiest, freaky look. 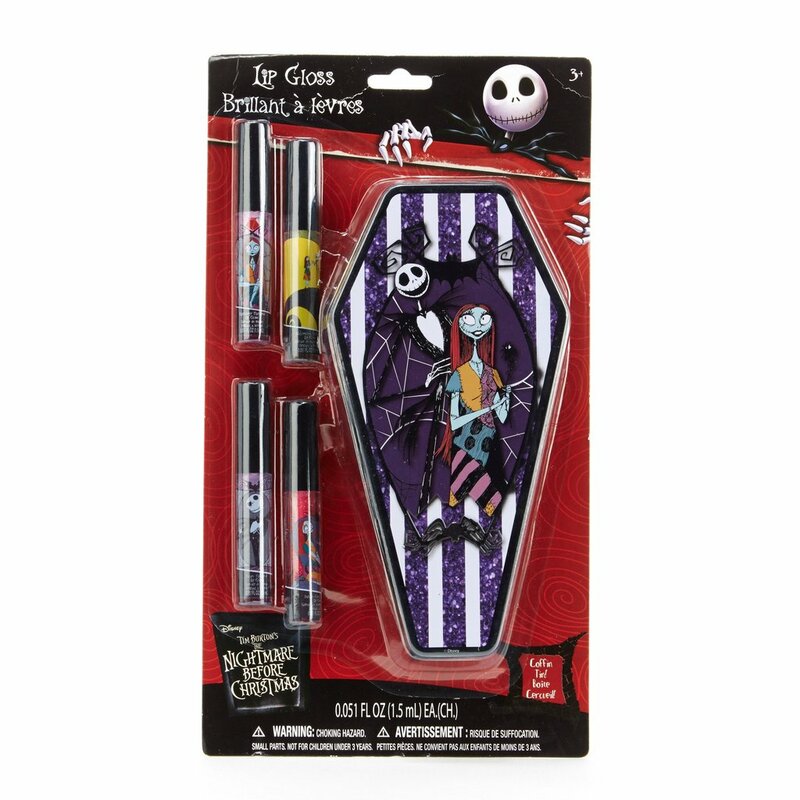 If she loves Jack and Sally, now she can get the Skellington look with lip gloss and nail polish that’s sure to look spook-tacular! I was able to review 5 of the items from the collection. My 9 year old was super excited as was I. I am a HUGE Nightmare Before Christmas fan and my kids are loving the movie just as much as I am. This lip gloss set is sure to make heads roll! Including four flavored shades of lip gloss and a coffin-shaped tin for storage, all featuring your favorite Nightmare characters, it will creep its way into your heart. $7.99. This lip gloss set is so cute!! I LOVE the coffin case, such a great idea for storage for your lip gloss. I also love how the lip gloss are flavored and taste yummy. These Nightmare lip balms, dressed up as lip sticks, are the perfect Halloween accessories. Their shades shift with her mood, perfect for embracing a variety of looks. 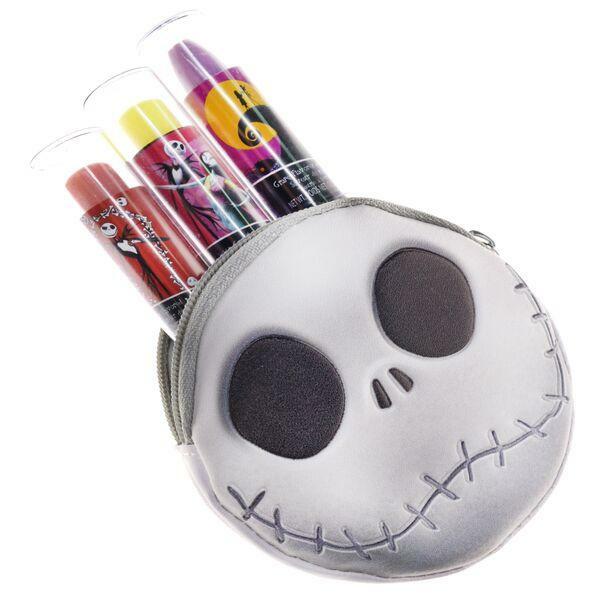 And also included is a bonus bag featuring Jack Skellington, because who doesn’t love a little Jack in their lives? $7.99. This set is perfect for any Jack fan! The mood changing lip balms are so cool and do change colors, plus are flavored with yummy flavors. This would make a great gift. These lip balms will creep and crawl their way into your heart. 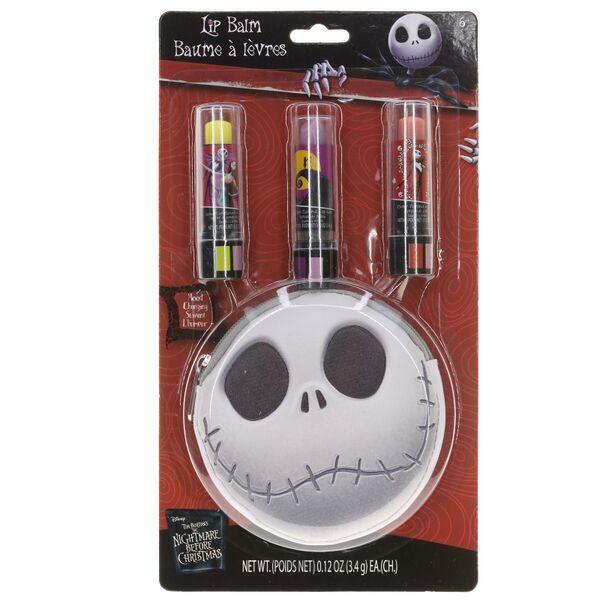 Nightmare themed, Jack-and-Sally lovers will love applying these fruity flavored balms to their lips! $4.99. This set is my favorite! 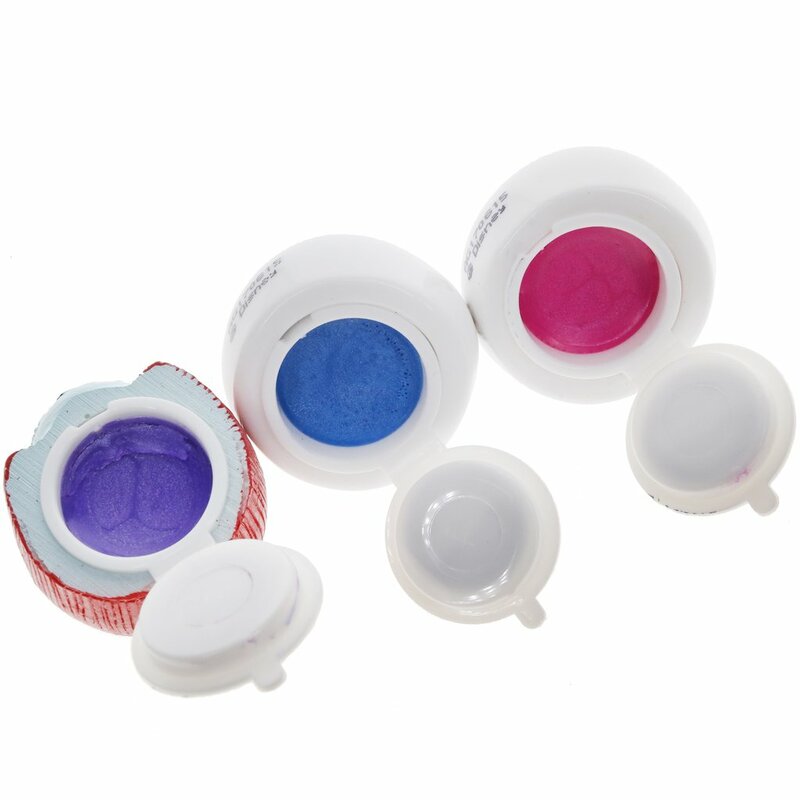 These little head lip balls are adorable and are perfect to carry in your purse or backpack. These would make great stocking stuffers. I also received an exclusive item not available yet on the website. This kit comes with an eye pencil, a sheet of tattoos, 1 set of faux eye lashes, 4 face paints and 2 face brushes. This would make a perfect addition for dress up for your child that loves the movie! So fun! These products would make great holiday gifts for any Nightmare Before Christmas fan, and perfect for the upcoming holiday season. 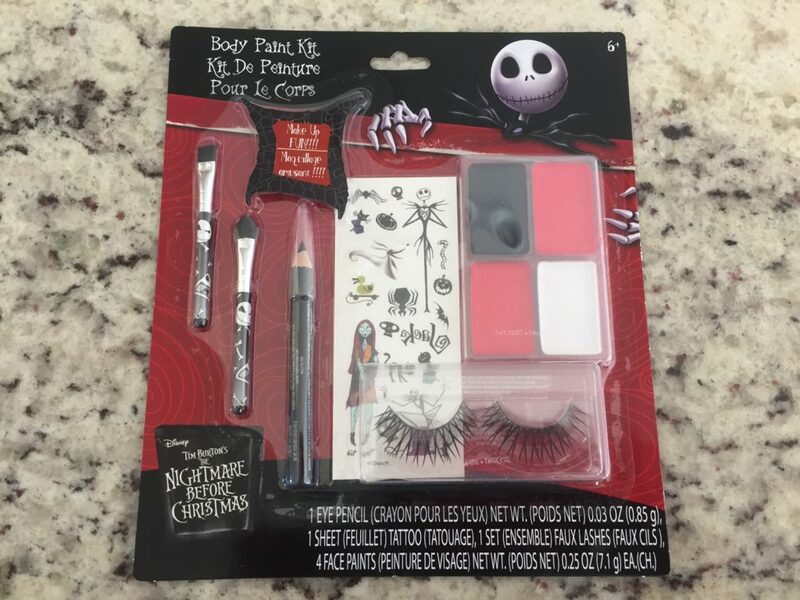 I will be choosing TWO readers who follow @TownleyGirl on Instagram to win 3-4 Nightmare Before Christmas items! Please comment below with your Instagram user name to confirm you have followed. U.S. residents only, giveaway ends on 11/20/2017. *I received the mentioned products in exchange for this review. All thoughts are my own. The holidays are approaching quickly, now is the time to start thinking of gifts for friends and family. Sometimes it is not easy to think of gifts for loved ones. You aren’t sure if they have something you are thinking of, but you don’t just want to give a gift card. I was contacted by Collage.com to review two of their customizable photo blankets. These would definitely make great gifts! Collage.com offers a variety of photo blankets to choose from. They offer: Fleece, Sherpa, Printed Woven, Plush Fleece, Plush Sherpa and Woven Image. The sizes of the blankets depend on which blanket style you choose. I chose to review the Printed Woven blanket and the Woven Image blanket. The ordering process was super easy. I chose the biggest size available (60×80) for both blankets because I knew I would be using one on my couch and one on my bed. 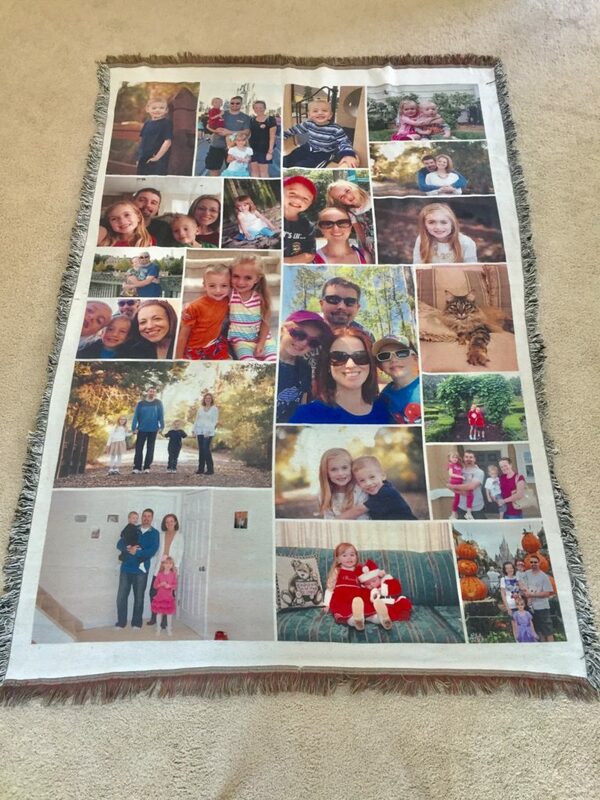 You can add as many photos you want to the blanket and rearrange the photos to show exactly where you want them on the blanket. you can upload photos right from your computer, Facebook and Instagram. You can add backgrounds, stickers effects and text. Possibilities are endless! I chose the Printed Woven with lots of family pictures. 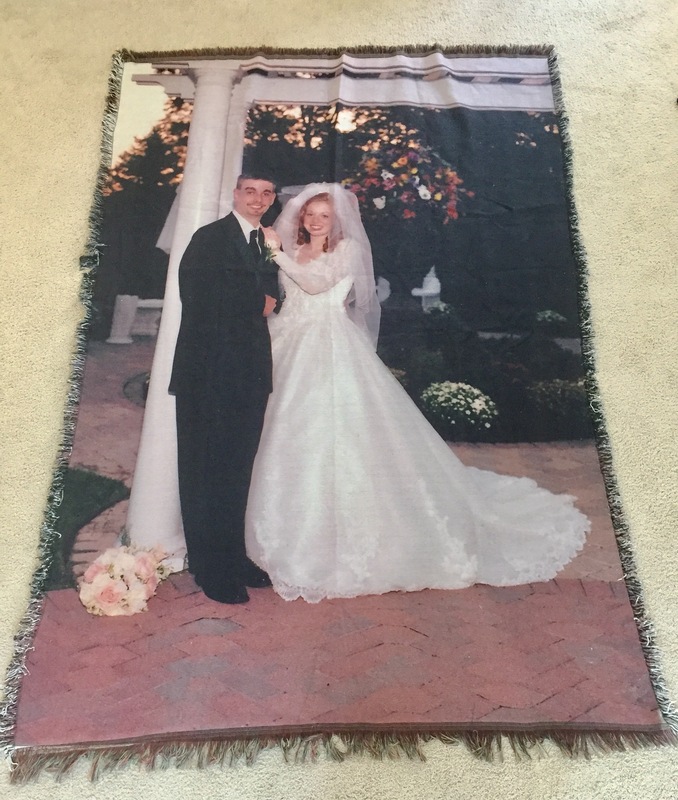 For my second blanket, I chose the Woven Image with one large photo. I am so excited how both of them turned out. Each blanket arrived in a clear carry case great for storage or travel. The blankets are super soft and they feel very heavy-duty. I love the large size of the blankets and each photo pops with color. The photos look absolutely perfect on the blanket. In conclusion, I am very happy and impressed with the quality of these blankets from Collage.com. I believe they are 100% worth the price, and I love how you can customize them any way you wish. These blankets would make great holiday gifts, wedding gifts, Anniversary gifts and birthday gifts! 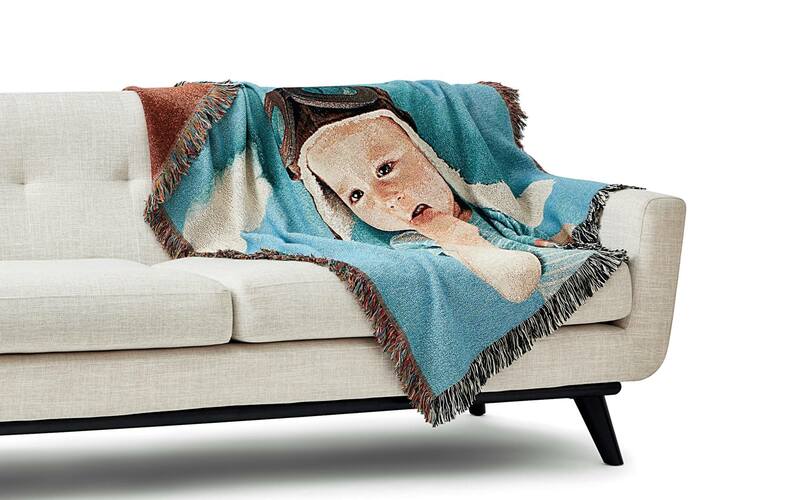 All of the blankets are backed by Collage.com‘s Just Right 100% satisfaction guarantee: If a customer doesn’t like his or her order, they make it right or refund money. New customers also get 60% off their first order. There’s a banner in the top left corner of the page where new customers can get the 60% off discount on their very first order. A great thing about these blankets is that each one of them is machine washable! No need to take to a dry cleaner! *I received the mentioned blankets in exchange for this review. All thoughts are my own. One lucky reader will win a gift card to Collage.com for a photo blanket of their choice! In the comments below, please let me know which photo blanket you will choose if you win. Giveaway ends on 10/13. U.S. residents only. Are you looking for a beautiful customized piece of jewelry with your children’s names on it? Look no further, Wickedly Mod has beautiful personalized bar necklaces in a variety of colors and engraving choices. I loved personalized items, especially when they have my children’s names on them. 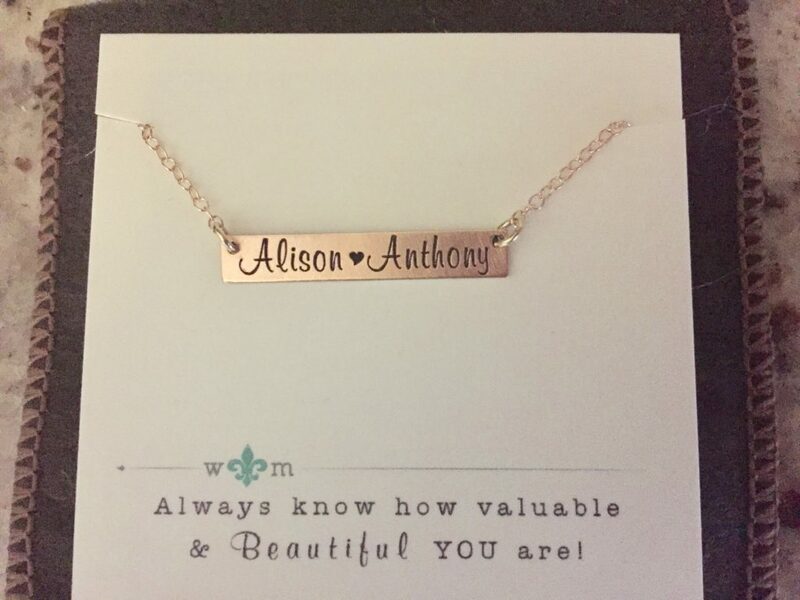 I was able to review a personalized bar kids name necklace from Wickedly Mod and cannot wait to tell you all about the gorgeous necklace and easy ordering process. 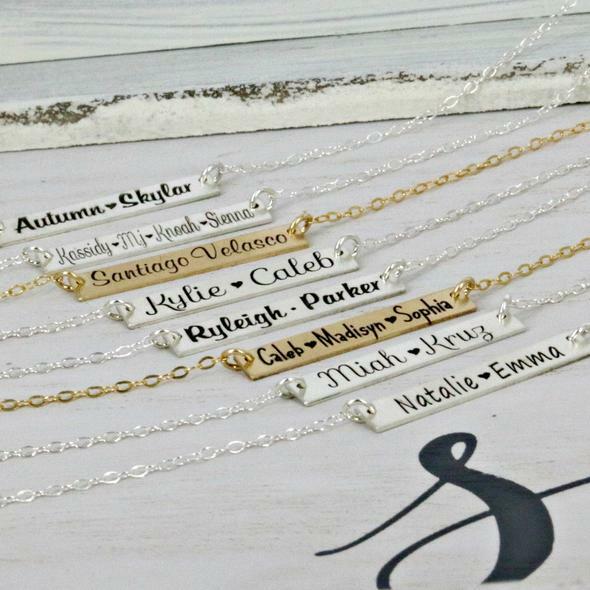 Personalized bar necklace with your kids name is the perfect gift for mom! You will receive a beautiful laser engraved personalized sterling silver, gold-filled, or rose gold-filled 30mm x 5mm bar necklace. Price starts at $38. MATERIALS: Made with either sterling silver, gold-filled or rose gold-filled. All pieces and components are made with the same materials. • We use a high end laser machine for all cuts and engravings. • Discounts are available for bridal parties and bulk orders (depending on total order value). Please contact us for more details. The first step to the ordering process is to decide on what metal choice to pick. The options available are: Sterling Silver, Gold Filled ($4 extra) and Rose Gold Filled ($8 extra). I chose the Rose Gold because I love that color. The next step is to choose your chain length. The options are 14″ to 30″ with that average adult length being 18″. I chose the 19″ because I like to wear my necklaces a bit longer than the average length. Prices will vary on how long you want the chain to be. The next step is choosing your engraving font. Wickedly Mod has an engraving font example photo that will help you choose the best font for your necklace. I knew I wanted a cursive type font so I went with “Trendy” and so glad I did since it came out exactly how I wanted and exactly how it looks on the example photo provided. The last step is to choose the name separator if you are personalizing more than one name. You can pick between a heart or a dot. I chose the heart. You can also add font to the back of the bar for an addition $7. Once your are finished personalizing your necklace, you can click the checkout button. This will have everything you have chosen listed so you can review it for any errors. Then you add your billing and shipping information and that is it! SHIPPING IS ALSO FREE!!!! You will then receive a confirmation email, and then a shipping email with tracking once your necklace ships. The process was quick and easy. I received my necklace about 6 days later. It came in a cute little box and velvety holder. I am so thrilled with how gorgeous this necklace is and the quality is amazing. I am so excited to wear it and show it off to my friends and family. I am looking forward to purchasing a few of these for my family members for the upcoming holidays! This necklace would make a perfect gift for any Mother, Grandmother, Aunt…etc for birthdays or holiday gifts. Use code MOMMYHASTOWORK15 for 15% off your entire order. *I received a personalized necklace in exchange for this review. All thoughts are my own. Wickedly Mod is generously giving one lucky reader a $50 gift card! To enter, please comment below to this question: “What will you order from Wickedly Mod if you win?” Giveaway ends on 10/10. U.S. residents only. I am fortunate enough to be the mom to two amazing daughters and they both happen to love science. My older daughter was so fascinated with microbiology in 6th grade science class that she used her birthday money to purchase a stuffed paramecium and euglena. (It’s OK…you can google it. I had to, too!) Their dad and I both have science backgrounds, so it makes me very happy that my daughters love learning about Science, Technology, Engineering, and Mathematics – or STEM – topics. But, did you know that while women make up 48% of the US workforce, they are only 24% of the STEM workforce? Young girls have untapped talent and potential to change the world through a STEM career, but how do we cultivate that interest at a young age? 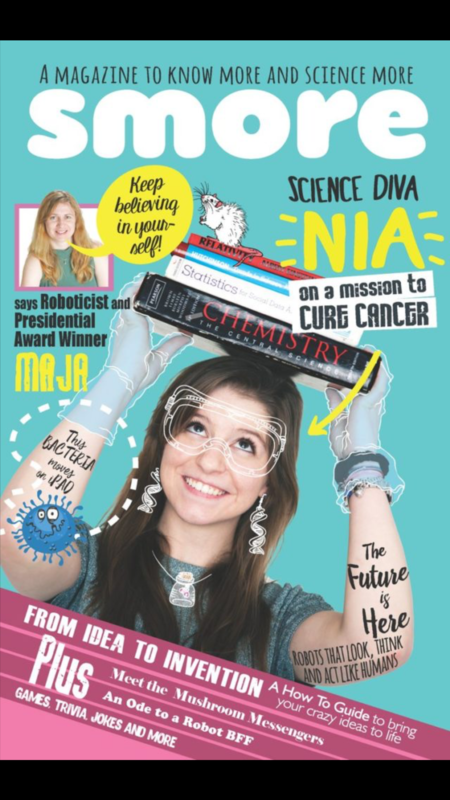 The creators of Smore are trying to do just that with their magazine created for girls ages 7 – 12 who love science. Every issue has nearly 50 pages of beautifully illustrated content, including science-related cartoons, how-to articles, trivia, reader contributions, interviews with female scientists, and a pullout poster. Plus, the entire magazine is ad-free. Both my girls really enjoyed checking out the inaugural issue of Smore. The articles and topics, complete with eye-catching illustrations and photographs, were perfect for my 8 year old to understand and enjoy, but detailed enough to keep my older daughter’s attention as well. As a mom, I love the educational content packaged in a high quality, fun-to-read magazine – and did I mention AD FREE?! Smore magazine has six issues a year and is available in print and digital versions. So if you have a young girl in your life, ignite her brilliance with a subscription to Smore magazine. 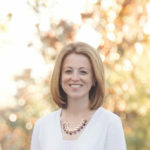 For more information, visit www.smoremagazine.com. Do you have a daughter, granddaughter, niece, or know a young girl who loves science? 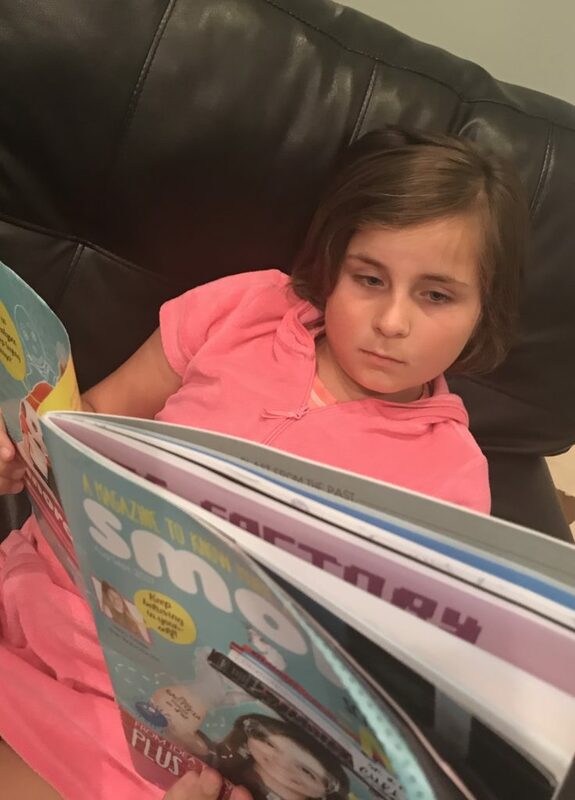 Comment below and let us know what she dreams of being when she grows up and you will be entered to win a copy of the inaugural issue of Smore magazine just for her! Giveaway ends on October 6th, U.S. Residents only. *I received a complimentary subscription in exchange for this review. All thoughts are my own.